And Help YOU Navigate Through These Chaotic Times! The world is changing at lightening speed, leaving many of us wondering what to do now? How can we create abundance in a shaky economic market? How can we maintain a positive attitude when the media has us all in fear? How do we stay in a state of harmony and grace, when chaos is swirling all around us? How do we maneuver through the maze of change taking place in the world today? The answer is simple … seek wise counsel. The angels, those unconditionally loving, benevolent beings of light that surround all of us, want nothing more than to hold our hearts and gently guide us through these transitional times. As messengers of God, they carry the divine wisdom of the ages. Seeking their guidance not only makes sense, it seems the only sensible thing to do. Contemporary Mystic, Lori Daniel Falk, did just that. She attuned with the angelic realm asking simply, what do the people of the world need to know now about issues such as … finding your life purpose … manifesting the life of your dreams … experiencing more joy … the role of the Lightworker … parenting Indigo and Crystal children … creating a harmonious family environment … balancing the divine feminine and the divine masculine within ourselves … finding your twin flame … recovering from abuse … attaining world peace … or your own inner peace? “Wisdom of the Angels” contains their answers. Not only did the angels bring forth their messages for you to read, they channeled beautiful angel art portraits through Lori, that are embedded with healing codes to assist you in grounding this wisdom into your heart, your life, your world. 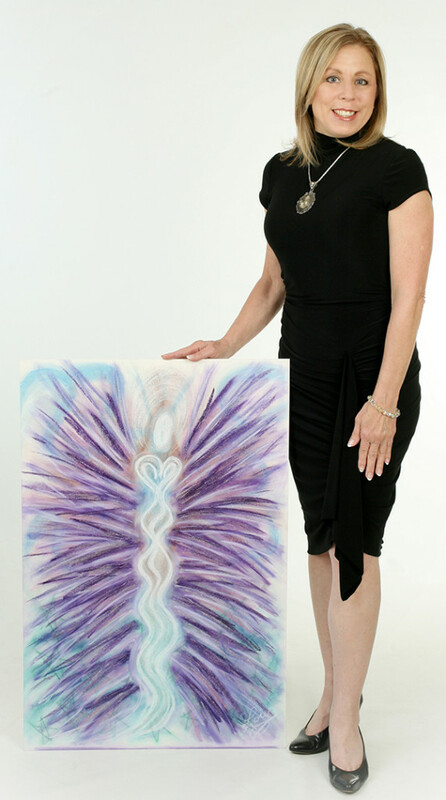 These magical Angelic Message Portraits™ are wonderful energy healing tools. They calm the mind, soothe the soul and enliven the heart. They carry a benevolent, loving energy from the angels that works with you at a deep heart level to bring comfort in time of need, as well as inspiration, hope and motivation. The Angels recently told Lori, “It would take several life times to gain the amount of knowledge necessary to fully embrace the ascension process we are currently evolving through.” As we don’t presently have the luxury of that amount of time, they are encoding the angel art I co-create with them, with the energy of that wisdom. The portraits then work with you at a heart level, enabling you to assimilate that knowledge directly into your emotional field, bypassing the cognitive mind, and enabling you instant access to it, without the need for total intellectual comprehension. “This fully describes my healing angel art … Through the use of pastel chalks, mineral pigments and illuminating glitter I am able to capture the healing energy of the divine in angelic portraits that engage the viewer through their use of vibrant color and reflective light, while simultaneously enabling them to assimilate the ‘Wisdom of the Angels’ … directly into their emotional field, simply by igniting their hearts. The Wisdom of the Angels … In Both Pictures and Words!